We make sure your private information stays that way... private! Here at GetDotted, we believe in everyone's right to privacy. That's why when you register domain names with us, you can rest assured that your registrant details are safe and secure. We don't publish your information and we'll never sell your email address or any other personal information and you're automatically protected from spammers. Improvements and changes to privacy law and how your data is handled now mean that when you register a domain name, none of your details will be published by default. Your details remain safe from spammers and general look-ups. Only law enforcement and similar organisations with legitimate interest or legal cause can request access to your details from the domain registry. A more private internet sounds great doesn't it? But what if you want to keep your details private whilst keeping an open channel of communication? That's where our WHOIS Contact Privacy comes in! Stay in touch without compromising your privacy. It may seem odd that our WHOIS Contact Privacy enables you to be contacted, but there are a number of reasons why you might want to keep an open channel of communication. Perhaps you're in the business of registering domain names as investments. Enabling prospective buyers to contact you is paramount. But at the same time, you don't want your registrant email address plastered across the internet, right? With our WHOIS Contact Privacy service, your registrant address remains hidden. 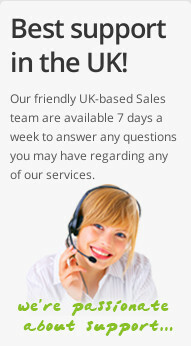 Anyone wishing to contact you is provided with a forwarding address so you can still receive the communications you want, without ever compromising your privacy, from just £2.00 per year. 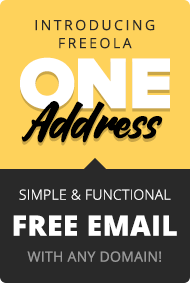 Already got domains with Freeola & GetDotted? 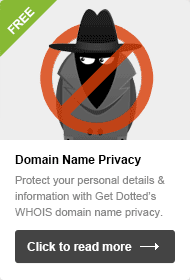 All you need to do is log into your MyFreeola account and visit the WHOIS Privacy Page where you'll be able to add contact privacy to the domain names easily. When registering a new domain, you'll have the option to add contact privacy in the checkout. To check the availability of any domain name, enter anything in the box below and click 'Search Now'.